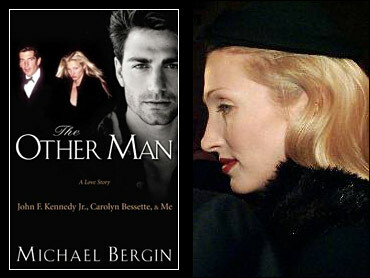 Former "Baywatch" actor Michael Bergin, who says he had an affair with John F. Kennedy Jr.'s wife less than a year after she was married, discussed their relationship in a book, "The Other Man," and on the A&E Network. Bergin, a longtime friend of Carolyn Bessette's, said his affair with Bessette as a married woman began in Los Angeles in 1997, when she spent 11 days with him after saying Kennedy was on a kayaking trip with his friends. "It just seemed like it was old times," he said. "Like ... we were together again. It was very surreal." Bergin was living in Hawaii in July 1999, when Kennedy and Bessette were killed in a plane crash off the coast of Martha's Vineyard. "I never really got a chance to say goodbye," he said. "Oh, God. I just, uh, I blocked so much of it out of me, for all these years and it's just, I think I'm reliving it right now." The interview airs Monday night on A&E. © 2004 The Associated Press. All Rights Reserved. This material may not be published, broadcast, rewritten, or redistributed. The latest additions include mostly new words, or phrases, but also some old words with new meanings or applications. Take snowflake, for example; It's still a beautiful ice crystal that floats from the sky during winter, but it now also has a usually disparaging meaning of "someone who is overly sensitive," according to Merriam-Webster's definition. The Los Angeles County Department of Public Health is investigating a measles outbreak after five measles cases were confirmed so far this year among county residents. The outbreak includes four confirmed cases linked to one another after international travel and an additional single case of measles after international travel, according to officials. CBS Los Angeles' Chris Holstrom reports.